I’m delighted to announce that the catalogue for “Law’s Picture Books” is now available directly through The Lawbook Exchange or through other online booksellers. The 220-page volume is based on an exhibition that I’ve co-curated with rare book librarian Mike Widener for the Grolier Club in New York. The exhibit opens to the public on September 13. If you can’t come and see the exhibit in person, the book includes images of every book on display, as well as their accompanying captions—plus more. “Illustrated law books” may seem like an oxymoron. After all, law is conceptual, analytic, and so very wordy! Yet for the past decade, over a thousand illustrated law books have been assembled in the Yale Law Library — spanning eight centuries and four continents. 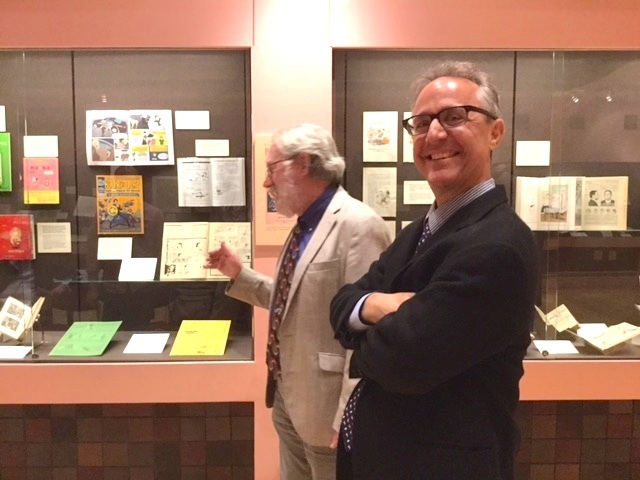 Law’s Picture Books began as a major exhibition of that collection at the Grolier Club in New York City, curated by Rare Book Librarian Michael Widener and legal historian Mark S. Weiner. In challenging the stereotype of legal literature as a dreary expanse of dry text, this book will surprise and delight both bibliophiles and members of the legal community. This handsome full-color book is enhanced by the essays “Collecting Yale Law Library’s Picture Books,” (Michael Widener), “Reflections on an Exhibition,” (Mark S. Weiner), “Ars Memoria in Early Law: Looking Beneath the Picture,” (Jolande E. Goldberg, Law Library of Congress), and “Law’s Picture Books and the History of Book Illustration,” (Erin C. Blake, Folger Shakespeare Library). As Mike Widener happily reports today in his blog, our short-short iPhone video “Putting Together a Book Exhibition” has won this year’s best video prize in the “Day in the Life” competition of the American Association of Law Libraries. The video documents the exhibition about illustrated law books that Mike and I are putting together for the Grolier Club in New York. N.B. : the exhibition opening date was recently moved forward from February 2018 to September 2017. We hope to see you there! April 21, 2016: The date of the exhibition has been moved forward from February 2018 to September 2017. This post and the video have been changed to reflect the new timetable. I’m delighted to announce that this video has won the “Day in the Life” video contest for the American Association of Law Libraries for 2016!